This magic trick is one of my favourite, easy to do, audience magic tricks. This magic trick is what I have called the Dream Card trick. I chose this name for two reasons. First, the storyline is that of having a dream where you see the name of an audience members chosen card. Second, this audience magic trick really is a dream to perform for people. Why? Because audience magic tricks are usually way more powerful than a magic trick that happens in the performers hands. (This is not a hard and fast rule but ask any professional magician and they will be in agreement 9 out of 10 times that audience magic tricks are far more powerful ). This Dream Card trick takes this to a whole new level as you don’t actually touch the cards during the performance. This makes the result seem almost impossible. Don’t underestimate how strong this is on spectators and audience members. It is REALLY strong. Plus you get to perform a killer magic routine that requires no sleight of hand skills at all. By putting the cards for magic tricks in the audience members hands you immediately involve them. The audience member feels special that you have asked them, they feel obligated to perform their part well, they feel invested in what is going on. In short, you have just given them a reason to care about your magic trick. Read this again, ‘you have just given them a reason to care about your magic trick’. This simple thing will elevate your magic tricks way above the standard of the ones your magic buddies are doing. While they are focusing on their classic pass and gymnastic card manipulation you will simply become a more sought after magician by focusing on magic tricks like this. That is, audience magic tricks that involve and engage the audience as opposed to tricks that make YOU the center of attention. How does the trick work? This card trick is simply a process. All you have to do is watch the video and remember the steps and you will be able to do it. Another great attribute of this easy magic trick is that you can do it with a borrowed deck of cards. 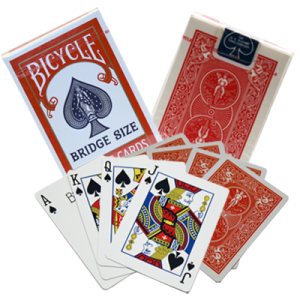 Audience members are twice as amazed when you perform with their cards and then do magic tricks in the spectators hands. Did you enjoy the Audience Magic Tricks? To learn more simple magic tricks Click here!